There are 3 hood sizes and 2 motor sizes to choose from (see chart ). Vent-A-Kiln's new Bench Mounted ventilator with spun aluminum hood, eliminates harmful fumes emitted from kilns while firing. Its size is ideal for smaller kilns. The new Bench Mounted Ventilator works in the same manner as the larger Vent-A-Kiln, with a low capacity 2 speed blower. The Bench Mounted ventilator comes with a three year warranty, 3 way switch, 6' cord with plug, venting hose, tail pipe and louvered end for outside venting and all necessary hardware for assembly. These table-mounted ventilation units are used for small ceramic kilns, jewelry kilns, burnout ovens (dental or any application/industry that utilizes burnout ovens). Useful for any professional or hobby that requires tabletop ventilation. They are easy to assemble and ergonomically friendly mounted to your bench or tabletop. 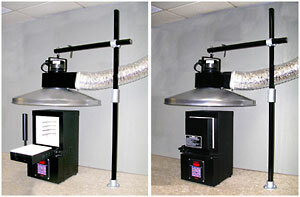 system that exhaust excess heat and fumes to the outside or into your existing duct-work. 3 standard models are available with aluminum spun hoods in diameters of 27 inches, 32 inches, and 37 inches. Removing and ventilating fumes is a critical concern in today's safety-conscious work environment. A bench-mounted ventilation system helps you provide a healthier work environment for you and your associates.